Photos taken at the Allenwood Retired Staff 2017 Christmas Dinner have been added to the Gallery page. A summary of NEC recent activities and correspondence is below. Letter sent to Chair Trustees, copied to all Trustees on 19th September, post the well attended Croke Park Trustee meeting. Reminder re no response sent to Chair on 27th November. There was an excellent attendance by RSA members at the AGM and we await the MPF Trustee deliberations, and response to the RSA resolution. The MPF Trustees undertook to discuss all agenda items tabled by RSA and review them at the next Trustees meeting and will revert to RSA with the outcome of those discussions. Letter confirming RSA issues discussed at Forum meeting 22nd November 2017 sent on 24th Nov. for the attention of ESB Senior Management. Response, hopefully, at next Forum meeting 24th January 2018. RSA met with former Minister Varadkar at end October 2016 and submitted – as requested – an 8 page document on 12th November. It was May 2017 before we received a written response to it. Since Summer, RSA have been seeking a meeting with current Minister Doherty through her Dept. to discuss that response and our request was repeated several times. We wrote directly to the Minister in November 2017 and have received confirmation via her diary Secretary that she is willing to meet with RSA but has lots of prior commitments presently. The Internal Market held on 22 September 2017 has now been completed. partially successful and sold approximately 7% of the shares offered. PwC will be writing to all successful and partially successful sellers and all bidders. Payments to successful sellers will be issued on 6 October 2017. With thanks to Michael Hughes for the photo. On behalf of ESBRSA I wish to thank you all for turning out in such numbers for last evening’s well attended meeting with ESB DB Trustees at Croke Park. There were many retired staff who travelled very long distances e.g. Cork, Galway, Lanesboro, Mayo, Waterford, and other branches and a special thanks to them for that effort and committment. anything? Lets wait and see. Trustees were left in no doubt as to to the mood of the Scheme members. I think all the speakers on the night did us proud – thanks to them – it must have been difficult to stand up and address the Trustees while ‘holding the cool’. ESBRSA would urge all retired & VS members to attend this meeting where possible. As members of ESBRSA and members of ESB DB Pension Scheme, we have and will protest publicly the fact that ESB has reneged on its pension promise to us concerning pension increases and support for the Scheme more generally. Our last pension increase was 1st Jan 2009. Since then employees have received 7.5% to date (August 2017) in increases while pensions have been frozen since Jan 2009 until Jan 2019. WHAT CONCERNS US TODAY WILL BECOME YOUR CONCERN IN TIME BECAUSE YOU WILL RETIRE, AND WHEN YOU RETIRE YOUR PENSION’S PURCHASING POWER WILL DECLINE OVER YOUR LIFETIME. WHY IS THIS? 1. ESB has reneged on its pension promise to support the pension scheme, stating it will no longer support the scheme beyond employer contributions for current employees and a once-off fixed lump sum. 2. ESB has reneged on its pension promise to index pensions to the updated value of grade/position one retired from. 3. A solvency test is being used to refuse any increase. 4. If the solvency test is passed, an annual increase equal to CPI but capped to a max of 4% where CPI is greater than 4%, will be paid. These factors have been employed to freeze pensions for 10 years and will be used to freeze pensions in the future or to limit future annual pension increases to 4% where inflation exceeds 4%. Any deficit will see benefits frozen or cut. ESB will refuse to contribute. DECLINING PURCHASING POWER IS NOT JUST AN ISSUE FOR PENSIONERS TODAY. YOU WILL BE EQUALLY AFFECTED WHEN YOU RETIRE. These factors, if not changed, should concern all employees who are members of this DB Scheme. Consider doing something about it while you still can. And do it soon, as your numbers are reducing with every passing year. (Only 30% of Scheme Members are employees). As an employee member of the Scheme you have representation through your trade union. When you retire you will no longer have access to representation or representation rights, even were you to remain a member of your trade union, as things stand. We are trying to change this position in respect of all matters connected with the pension scheme. WE ASK YOU TO PURSUE, THROUGH YOUR UNIONS, IMPROVEMENTS TO INDEXING OF PENSIONS, AND TO PRESSURE ESB TO REVERT TO ITS TRADITIONAL SUPPORT FOR OUR PENSION SCHEME. THE 2010 AGREEMENT PUSHED THE PENDULUM TOO FAR AGAINST ALL MEMBERS OF THE SCHEME. IT IS TIME TO PUSH BACK. ONLY EMPLOYEES HAVE THE LEVERAGE TO ACHIEVE IMPROVEMENTS. Currently the Scheme is fully funded in actuarial terms and can meet all its liabilities on an ongoing basis. Any suggestion that payment of pensions is in any way dependent on current employee contributions is wrong. Pensions are safe and will be paid at the point of retirement as long as the Scheme remains a going concern and is fully funded in actuarial terms. Pension purchasing power post-retirement is not safe and can be destroyed over your lifetime by a pension freeze or by inflation greater than 4%. A pension freeze will arise where the Minimum Funding Standard (MFS) is not met. The 2010 Pension Agreement has enabled ESB to solve a MFS deficit by freezing / cutting benefits for those already retired and for those yet to retire when they retire. It is vital that ESB is persuaded to move from its current stated position regarding support for the Scheme. Discuss in your workplace and lobby your unions and management. ESB must be held to its pension promises if the values of pensions in retirement are not to be eroded. The EU inflation target is 2% per year. Had this applied since Jan 2009, pensioners would have suffered a loss of more than 20% in the purchasing power of their pensions by Jan 2019; this is the scale of risk dumped onto members of the scheme by ESB’s refusal to support the scheme in keeping with its pension promises. DO YOU WANT THIS PROSPECT TO FORM PART OF YOUR FUTURE? From ESB Retired Staff Association on behalf of retired members of DB Scheme. confirmation of the Market Day will issue to participants. We would also urge members to send an email to pensions@esb.ie to express your interest in attending the meeting. OR to complete and return the form provided by the 28th. July. “This Annual General Meeting of the National Executive of the ESBRSA calls on the Trustees of the Medical Provident Fund to approve the drawdown of MPF Reserves to offset any future shortfalls of income over expenditure and to refrain from imposing future subscription increases. This course of action to be reviewed after a period of 3 years”. I am asking you to inform ESB Joyce and Jason, also James O’Loughlin as Secretary to MPF and as Secretary to Trustees. A Review of the ESB Defined Benefit Pension Scheme – The Path to Pension Increases produced by Trident Consulting for ESBRSA is now available. Members of ESBRSA can get a copy of the review on application to their Branch Secretary. 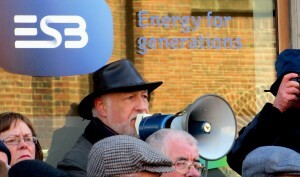 I’m writing to you on behalf of members of the ESB Retired Staff Association. It has come to my attention recently from listening to national radio that there is still a lot of anger and discontent among pensioners regarding the Government Pension Levy which some would describe as the greatest “smash and grab raid” by the Government on private pensions. This same anger and resentment exists among members of our Association. The levy raided private pensions to the tune of €2.5 billion in the period 2011 to 2015, under the provisions of the 2011 Finance Act. The recent Government initiative to restore the public service levy over a number of years with no attempt to similarly make restoration to private pension funds has probably given rise to this continued anger and resentment. Recent comments on national radio have questioned the legality/constitutionality of the original Government legislation enacted in 2011 that gave rise to the levy and granted them the authority in a legal sense to levy private pension funds. The constitutionality has been questioned in that a pension is the property of an individual and that the levy is an infringement of that individual’s property rights. As Pensions Regulator, I would ask you the same question as many pensioners have asked. Are you satisfied, as Pensions Regulator, that the legislation giving rise to the Government Pensions Levy is legally sound and is not unconstitutional or an infringement of an individual’s property rights? The two ESBRSA letters below await a response from Minister for Finance, Michael Noonan. I’m writing to you on behalf of ESB Retired Staff Association (ESBRSA) with regard to USC as applied to pensions. There has been much talk about USC this year and efforts have been made to relieve the burden of USC on taxpayers. There is a glaring anomaly that exists between two categories of ESB pensioner, namely those who joined ESB pre-1995 paying class D PRSI with no entitlement to a State pension and those who joined post 1995 paying class A PRSI with entitlement to a State pension. That same anomaly exists between pensioners in receipt of a State pension and those in receipt of private pensions. State pensions are exempt from USC, so post 1995 pensioners in receipt of an integrated pension comprised of the State pension and the balance being a private pension do not pay USC on the State pension portion. Yet those in receipt of private pensions pay USC on all of their income. This anomaly exists between public service employees who were employed pre-1995 and those employed post 1995. It also exists with any pensioner whose income is comprised of a State and private pension. In the interest of equal treatment this issue needs to be addressed. It is unfair and unjust to have two categories of pensioner treated differently with regard to the application of USC. In order to rectify the situation, I suggest that from January 2017 where an individual is in receipt of a private pension only, that the equivalent amount of the State pension, (€12,000 p.a. approx.) be exempt from USC and that USC rates are then applied on the balance of their income i.e. 0.5%. on the first €12,012 (after the exemption) and 2.5% on the next €6,760 and so on etc. I trust that this matter will be given serious consideration and that the Finance Act will be amended to provide for changes outlined above. On behalf of ESB Retired Staff Association (ESBRSA) I’m writing to you yet again regarding the Government Pensions Levy. Despite the popular belief that the Pensions Levy is gone, abolished, and that the Government’s great “smash and grab” raid of €2.3 billion on private pension funds and individual’s pension savings will be forgotten and fade into the mists of time is far from the truth. The majority of pensioners receive a weekly/monthly reminder that the pension levy is very much alive in the form of a deduction on their payslip in respect of the levy. ESBRSA still receive queries from members regarding the pension levy as to why they’re still paying the levy and I quote “ didn’t the Minister abolish the levy in the budget”. They are now coming to the realisation that they will pay the levy for the rest of their natural lives and as a married person if they predecease their spouse, the spouse is then burdened with this unfair Levy for their lifetime. As far as pensioners are concerned this Government’s legacy will be the Pensions Levy and other Budgetary measures that targeted the elderly, such as the abolition of the Telephone Allowance and the Bereavement Grant. I have no doubt that the “Grey Vote” comprising 33% of the electorate were somewhat responsible for the outgoing Government’s extremely poor performance in the last General Election. The name of this organisation shall be known as the ESB Retired Staff Association, hereinafter referred to as “The Association” and commonly known as R.S.A. The ‘Place of Meeting’ may be any or such place as decided by the Executive Committee or Branch Committees as appropriate. The aim of the Association is to represent its members, promote their welfare and provide opportunities for social interaction. The Association will endeavour to represent the best interests of all its members in matters relating to the ESB Defined Benefit Pension Scheme and in its dealings with the other stakeholders in the Scheme. The Association will at all times act to protect the pension income and all other general benefits accruing to its members. (This will include items such as MPF, Credit Union, ESOP and Household Benefits Package). The Association will affiliate and cooperate with the appropriate national organisations in order to further its aims and objectives. The Association will take any steps necessary to publish and spread its aims and philosophy by such means and in such manner as it shall deem fit, including print and other forms of electronic media. The business and affairs of the Association shall be managed by local Branch Committees, a National Executive Committee (NEC) and a subsidiary General Purpose Committee (GPC). The National Executive of the Association (NEC) shall receive an agreed amount annually based on Branch numbers from each Branch committee to defray cost of meetings, postage, stationery etc. All monies received shall be lodged in a bank or credit union account in the name of the Association. By joining the Association, members are giving it the authority to represent them in all matters related to their pension and all other benefits. The number of Branches shall be based on geographic location subject to NEC approval. Members resident in those locations should form a branch as designated by the NEC and elect a committee at an Annual General Meeting (AGM). Conflict over boundaries will be referred to NEC for adjudication . Members who change residence, may, if they wish, retain membership of their original branch. The committee shall at least consist of a Chairman, Hon. Secretary and Hon. Treasurer. The Branch committee shall also consist of a number of members to be decided locally and shall have the power to co-opt and to fill vacancies, as necessary, during the year. Branches may appoint additional officers to meet their own requirements. Notice of the AGM shall be given at least 14 clear days prior thereto, by post, email or other satisfactory means. Resolutions for the AGM shall be notified in writing to the Hon. Secretary at least 7 days prior to the AGM. Resolutions not notified to the Hon. Secretary in advance of the AGM may only be put to the meeting on the day of the AGM provided they are proposed and seconded and passed by a majority of the members in attendance at the AGM. The Hon. Secretary of the local Branch committee shall notify to the Hon. Secretary of the NEC all the names and offices of its elected officers. The local Branch committee shall appoint a delegate or delegates to the NEC for the coming year, depending on the number designated by the NEC . Substitute delegate or delegates should also be appointed to NEC for the coming year. In the event of the delegate(s) or nominated substitute(s) being unable to attend a meeting of the NEC, the Branch committee shall nominate substitute(s) to attend that meeting of the NEC. The name of the substitute(s) shall be notified to the Hon. Secretary of the NEC in advance of the meeting. Branches should consider rotation of delegates in order to get more members involved at NEC level. Ordinary meetings of the Branch committees shall be held on such dates as may be found convenient for the transaction of business upon at least 3 days notice being given by the Chairman. The Branch Committee should endeavour to hold as many meetings as possible to suit local needs. A quorum shall consist of half the membership. The Chairman shall preside over the meeting and shall have a casting vote in the event of a tie. A request may be made to the Chairman by no less than a quorum of the committee for a special meeting of the committee, stating the nature of the business to be transacted. If the Chairman neglects or refuses to call such a meeting within 7 days, the meeting may be convened by notice given by a quorum of the committee. Extraordinary General Meetings may be called at any time by direction of the Branch committee or at the request of at least 10% of the Branch membership. At any meeting of members, if a majority present wish any motion under discussion to be put to vote by ballot, this mode of voting shall be adopted. The National Executive Committee, hereinafter referred to as the NEC, shall consist of a delegate or delegates nominated by Local Branch Committees at their AGM. A Branch shall appoint no more than two of its members to the NEC. An exception to this will be Head Office and Dublin Region Branches who may each appoint up to five delegates. The NEC shall hold its AGM in the month of June each year and shall elect officers i.e. Chairman, Hon. Secretary, Vice Chairman/Asst Secretary and a Treasurer. Nominations for these four officer positions shall be proposed by branches in writing to the Hon. Secretary at least 14 days before the AGM. If there is more than one candidate for any position an election will take place at the AGM. The candidate with the highest number of votes will be appointed to the position. The NEC may appoint any other officers considered necessary. The NEC shall remain in office for a period of one year. Should a delegate vacancy or vacancies arise during the year, the Branch Committee which appointed the vacating delegate may appoint a replacement for the remainder of the year. Should any of the NEC officer positions become vacant during the year, the position will be filled by the NEC at the next meeting. Delegates should be made aware of the vacancy prior to the meeting so that due consideration can be given to the appointment of a replacement officer. If an election is necessary, the candidate with the highest number of votes will be appointed. Delegates will have the option of co-opting an existing GPC member or other delegate to fill the position. Nominees for any NEC Officer or GPC position who are not present at an NEC meeting at which an Officer or GPC position will be appointed, must indicate in writing to the Hon. Secretary that they accept the nomination. Resolutions for the AGM shall be notified in writing to the Hon. Secretary at least 14 days prior to the AGM. The proposed resolutions shall have been circulated to all delegates at least 7 days before the Annual General Meeting. Resolutions not submitted in accordance with the above, cannot be put to the meeting on the day of the AGM. Ordinary meetings of the NEC shall be held every quarter on such dates as may be found convenient for the transaction of business upon at least 7 days notice being given by the Hon. Secretary. A quorum shall consist of half the membership of the committee. The minutes of the previous meeting shall be circulated to all delegates at least 7 days prior to the meeting. The Chairman shall preside over the meeting and shall have a casting vote in the event of a tie. A request may be made to the Chairman by no less than a quorum of the NEC for a special meeting of the committee, stating the nature of the business to be transacted. If the Chairman neglects or refuse to call such a meeting within 7 days, the meeting may be convened by notice given by a quorum of the NEC. Extraordinary General Meetings of the NEC may be called at any time by direction of the entire NEC, or a quorum of the NEC or at the request of at least 10% of the General membership of the Branches. At any meeting of members, if a majority present wish any motion under discussion to be put to vote by ballot, this mode of voting shall be adopted. The NEC shall review and fix the contribution to be paid each year by each Branch based on number of members contributing through deduction at source. Branch subscriptions for each calendar year should be paid by the end of the first quarter (31st March ) of that calendar year. A record of all NEC members names and addresses by Branch, and updated annually, shall be held centrally by NEC/ GPC. The use of these details shall be restricted to RSA business. Prepare minutes and notices for all GPC and NEC meetings. Notice and agenda for meetings together with minutes of previous meeting shall be circulated at least 7 days prior to each meeting. Carrying out the instructions of the Chairman and the Annual General Meeting. Make the necessary preparations for elections and record the voting process. The Chairman shall preside over all meetings of the GPC and NEC. The Chairman shall be responsible for reviewing and signing minutes, signing cheques, and ensuring all members of the NEC abide by the provisions of the constitution. The Vice Chairman shall have all the powers of the Chairman in his absence. The Treasurer is the custodian of the Association’s funds. Control the finances of the Association and shall deposit all funds in a recognised Bank or St. Patrick’s Credit Union (ESB Staff) Ltd. in the name of the Association. Pay all bills accruing within a reasonable time as instructed by the GPC/NEC. Sign all cheques which shall be countersigned by the Chairman, Hon. Secretary or Vice Chairman. Audit. He/she is responsible for submitting all papers, accounts and documents to the auditors for the yearly audit. He/she is responsible for ensuring that the Audited Annual Accounts are available for circulation in advance of the NEC AGM. The Chairman, Hon. Secretary, Vice Chairman/Asst Secretary, and the Treasurer shall automatically be deemed elected to the GPC at the AGM. A maximum of 5 committee members shall also be elected to the GPC. If more than 5 are nominated, a vote shall be held at the AGM to elect the 5 GPC members. Candidates with the highest number of votes will be appointed. Should a GPC position become vacant during the year, the position will be offered to the candidate unsuccessful at the AGM with the next highest number of votes. The GPC shall meet usually every month, but may meet more often by arrangement to deal with urgent matters at short notice if the situation demands it. The GPC shall be subject to decisions made by the NEC but in special circumstances, where speed of action is required and the interests of the members are at risk, the GPC may act on it’s own initiative and advise the NEC of any such action taken. The NEC or the GPC, on instructions of the NEC, shall engage in negotiations or discussions with the appropriate authorities to protect the interests of retired and VS members at all times. They shall keep the Branches informed of the progress of any negotiations or discussions at all times. The GPC shall be empowered to obtain legal, financial or actuarial advice, particularly with regard to pension matters in order to protect members interests. They shall report to NEC at all times on progress in any such dealings with professionals and any expenditure for advice shall be approved by NEC. The GPC may invite observers to attend its meetings. Such observers will be chosen by the GPC from existing NEC delegates and may participate fully at all GPC meetings with the exception that they will not have voting rights. Observers may not exceed more than two in number at any time. No articles of the constitution of this Association may be amended or altered, or new articles inserted except on a vote of the voting members present at an AGM of the NEC and such vote shall require a two thirds majority. The proposed amendments shall have been received in writing by the Secretary at least 21 days prior to the Annual General Meeting or Special General Meeting. The proposed amendments shall have been circulated to members at least 7 days before the Annual General Meeting or such Special General Meeting. Officers of the NEC and delegates who may have been elected or co-opted to the NEC or GPC may be removed from office by a two thirds majority vote of delegates present at an NEC meeting. ESB Staff Services is available via the LINKS page. ESBRSA have had many calls and emails recently from members requesting information/guidance regarding the upcoming Trustee election. You will have received election material and ballot papers for the upcoming election of member Trustees, both employee and retired, to the board of Trustees for the ESB Pension Scheme. The latest date for the return of ballot papers is Monday 27th June 2016 and our next NEC Meeting is Thursday 30th June 2016, so we will not be in a position to discuss the Trustee elections before the ballot deadline. You are also aware of the selection process that member nominees for the Trustee positions must undergo prior to their names appearing on the ballot paper. ESBRSA are totally opposed to this process and have made their views known in the strongest possible way to both ESB and Pension Scheme Management and have demanded that this process be abolished. This process applies to member nominees only. Davy Naughton, whose name appears on the ballot paper for retired member candidates, was one of the main architects and signatories of the, now infamous, 2010 Pensions Agreement between ESB Management and ESB GOU. 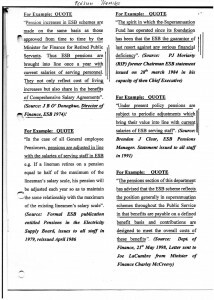 This Agreement between these two parties excluded any input or involvement from ESBRSA and was highly detrimental to pensioners as a group, abandoning the long observed custom and practice of linking pensions to staff salaries and imposing an indefinite pay freeze on pensioners. ESBRSA do not recognise this Agreement and are currently working hard to overturn it’s measures imposed on pensioners. The current incumbent on the Board of Trustees, and elected at the last Trustee election as a member Trustee is Jim Dullaghan. While he has had no official contact with ESBRSA we are aware that he has been acting in the interests of retired and all Pension Scheme members in his official capacity as an elected Trustee. ESBRSA cannot comment on the other candidates on the ballot papers as we have had no contact, official or otherwise, with these candidates. I hope this information will be helpful for your members when making decisions in the upcoming election. Please ensure that this notice gets the widest possible circulation among your membership. and will now take place at Wynn’s Hotel, Lower Abbey Street on Monday 27th June at 2 o’clock. Tea/coffee/biscuits will be provided at end of the meeting. Thanks to Tony Evans who has supplied the last missing name for the photo of the 1st Year Apprentices, Dec. 1959 at College of Technology, Kevin Street in the Gallery page. All 45 in the photo are now named. The Galway Branch Page went live on the ESB RSA website today 19th May 2016. A Re-engagement meeting will take place in ESBI, Dublin on 19th May. on 26th May and 22nd June 2016. Sessions Theme is ‘Pensions Expert Presentation’ and ‘RSA Representation Presentation’. Wynn’s Hotel, Lower Abbey Street, Tuesday 17th May, 2:15 PM. Tea/coffee/biscuits will be provided at end of meeting. Wynn’s Hotel, Lower Abbey Street on Thursday 9th June at 2 o’clock. The notice and agenda should be arriving at members homes late this week or early next week. Do you have a story about Pat or any photos we could use as part of his presentation on the night? Please email to Anne-Marie.Casey@electricireland.ie or send to Anne-Marie Casey, Finance, Electric Ireland, Building 2 Swift Square, Northwood, Santry, Dublin 9 on or before 29 April 2016. Please mark your photographs with a name and return address. AFTER 36 YEARS SERVICE JOHN HAS DECIDED TO RETIRE. A FUNCTION TO MARK JOHN’S RETIREMENT WILL TAKE PLACE IN THE SHIRLEY ARMS CARRICKMACROSS CO MONAGHAN ON SATURDAY 30TH APRIL AT 7.30PM SHARP. Can you help in naming some of the unknown golfers from 1992 in the photo added today to the Gallery? With over 36 years service, Andy Hanson is retiringenbsp; at the end of February. All of us that have had the pleasure to work with Andy, are well aware of his immense contribution to ESB over these years. His experience, knowledge and specifically his enthusiasm will be greatly missed.To mark the occasion Andy would like to invite his friends and colleagues to join him for a drink in the Claytonenbsp;Hotel (formerly Bewleys) in Leopardstown at 5PM on Friday the 4th March. Launching this week – the Great ElectricAid Election predictor! Get your anorak on, and have some fun with the Election. Predict the seats outcome, party-by-party. You could scoop the prize pool – and it could be massive. 50% of the entire entry pool will go to the winner(s); the rest will go for fantastic projects in Ireland and the Developing World. HOW PENSIONERS HAVE BEEN HIT BY AUSTERITY ! See also the ELECTION SPECIAL ISSUE Newsletter in the Cork Branch Page ! The first combined Dublin Region and HO Branches afternoon social will take place in Wynn’s Hotel, Abbey St., Dublin 1 on Tuesday January 19th from 2pm to 5pm. The Officers of the National Executive of ESBRSA met with James O’Loughlin and Paul Duignan on 1st December 2015 and raised the following issues/questions with regard to the ESB Defined Benefit Pension Scheme. ESBRSA believe that this revised wording is typical of a “Balance of Cost Scheme”, as indicated by the ESB Pension Fund Actuary during the very public Industrial Relations dispute in December 2013. It makes ESB liable to make payments to the Scheme to address future deficits as determined by the Actuary. In “considering” the above mentioned legislation have you, at any stage, in recent years challenged ESB legally or otherwise with regard to their statutory obligation under this legislation. This would be of particular interest to all Scheme members as certainty on this obligation would guarantee the security of future Scheme funding. It would also be of particular interest to all Scheme members that you and your fellow Trustees would challenge ESB’s statements in its Annual Reports for the last 5 years that it has no obligation to increase its contributions to the Pension Fund in the event of a deficit. This is contrary to ESB obligations under the amended Section 7 (1) (b) of Electricity Supply Board (Superannuation) Act, 1942. Questions were also raised with regard to ESB Industrial Council Recommendations 2354 & 2354a issued in 1992 and 1993 dealt with the aftermath of the 1981 Comprehensive Agreement and the merging of the “Manual Workers” and “General” Superannuation Schemes. The full background to these cases is contained in the files held in the Industrial Council offices in Fitzwilliam Place. As part of its commitment to those JIC recommendations ESB gave an undertaking that in the event of Pension Scheme deficits arising in the 30 year period from 1993 to 2023 that these deficits would be referred back jointly with ESB Group of Unions to the Industrial Council for investigation and deliberation. ESB has failed to live up to this commitment, particularly in relation the major Scheme deficit of €1.9 billion in 2008. Are you and your fellow Trustees aware of the background to these JIC recommendations and have you challenged ESB on the Company’s failure to live up to this commitment. Notwithstanding ESBRSA’s non recognition of the 2010 Agreement between ESB and ESB Group of Unions and without prejudice to our position the statement in the Pension Scheme 2014 Annual Report is contrary to this agreement to which retired members have been subjected to. There will be further discussions on the subject of a pension increase, particularly in the context of accrued pensions for serving staff being revalued by CPI +1% since January 2012 thereby creating a gap of 5.49% on a compound basis between pensioners and serving staff. The Actuarial Valuation and assumptions contained therein will also be discussed, particularly in relation to the sensitivity analysis and lack of clarity surrounding the strengthening of the life expectancy assumptions in the 2014 valuation given that assumptions in the 2011 valuation were a good estimate for actual scheme experience. I would appreciate the views and comments of you and your fellow Trustees on the questions raised above and look forward to hearing from you. The Vincent Brown programme (‘The People’s Debate’) will be aired on Wed. Jan. 13th at 10pm on TV3. (Info from Northside People (East). Pensions will be one of the topics discussed. I thank you for your letter dated 22nd December 2015. Or should I be addressing, Mr. Lalor, your private secretary, in whose name replies are issued, or even the officials in the Dept. of Finance, who in reality prepare responses to the Minister’s correspondence. I have my doubts that you, Minister, are, in fact, reading the myriad of correspondence on the subject of the Pensions Levy. If not, you should be made aware of the political implications for this Government as a result of the imposition of this unjust Levy in the context of the upcoming General Election. I accept your clarification of the differences between the levy on public sector salaries/pensions and the stamp duty of 0.6% imposed as a levy on the assets of Private Pension Funds thereby confiscating €2.4 billion of pensioners’ savings over a 4- year period. You can “dress it up” whatever way you like and use fancy titles such as “PRD” and “PSPR” but the reality is that both levies were introduced by the current Government as austerity measures and targeted the incomes of Public Sector pensioners and the assets Private Pension Funds. The essential difference between the Public Sector Levy and the Levy on Private Pension Funds is that the former is being restored over a number of years to Public Sector staff/pensioners thereby increasing their incomes and the latter has had the effect of permanently reducing the assets of Private Pension Funds by €2.4 billion and consequently the incomes of pensioners from whose incomes the Government Pension Levy is being recovered. The ESB Pension Scheme assets alone were reduced by almost €100 million. The stark reality for private pensioners is that the reductions in their incomes as a result of the recovery of the cost of the levy to Pension Funds is a permanent reduction for the lifetime of the pensioner and also a permanent reduction on a surviving spouses pension for his/her lifetime. In order for the incomes of private pensioners to be restored in a similar and equitable manner to those of Public Sector staff/pensioners the assets of Private Pension Funds must first be restored. This is an issue of equity for private pensioners. For this reason, I am calling on you, Minister, to restore the assets of €2.4 billion confiscated from Private Pension Funds gradually over a number of years as the economy improves. An article in Friday’s Irish Independent by Charlie Weston quotes Minister Ged Nash in the context of families being much better off as a result of measures introduced in the last Budget “The scrapping of the pensions levy will mean hundreds of thousands of private-sector workers and pensioners will be better off”. I would also ask you, Minister, and your Government colleagues to desist from disseminating misinformation on the subject of the Government Pensions Levy for the purposes of political gain. The Minister for Finance, Mr Michael Noonan TD, has asked me to respond to your further correspondence regarding the pension fund levy. It may be worth clarifying the issue of levies relating to public sector pensions, which you mention in your letter. While public service pensions are not fund-based and so have not been subject to the Pension Fund Levy, serving and retired public servants have been subject to the Pension Related Deduction (PRD) and Public Service Pension Reduction (PSPR) as appropriate, reducing, respectively, salaries and pension payments. While changes to the PRD and PSPR are proposed to start from next year which will result in reductions in the PRD and the PSPR, particularly affecting public servants on low and middle incomes and retired public servants in receipt of low pensions, there is no provision for the repayment of PRD or PSPR deductions which have already been made. We thank all of our 20,000+ visitors for your support during our first year of ESBRSA Website presence and wish you a Happy Christmas and a Peaceful and Prosperous New Year. Matt Kelly ESBRSA Website Admin. You might like to use the form below to send an email or letter to ESB saying that you would prefer to get a copy of EM posted to you. I request that I be sent printed copies of EM on a bi-monthly basis by post. An important resolution was passed at the recent Dublin H.O. Branch Committee meeting. See Dublin H.O. Branch page. The site includes information on why MPF is the provider of first choice for ESB Group staff, details of our comprehensive plans and competitive prices, and a ‘Frequently Asked Questions’ section that hopefully will provide you with a quick answer to some of the most common queries we receive from members. The ‘Guide to Health Insurance’ link we feel will be of great benefit to anybody thinking of private health insurance for the first time or transferring their insurance to MPF. We understand that you may be confused and overwhelmed by the plethora of information on offer from the various health insurers in Ireland and our aim is to demystify the process. We also compare our 3 schemes with the four major health insurers in the Irish market so that you can make an informed decision about your future healthcare armed with all the facts. We hope you enjoy reading about all MPF has to offer on our new website. It also contains a ‘Contact Us’ section and we would be pleased to hear your views on the website and of course to help with any queries you may have. Our thanks to Michael Hughes, John Frain, Charlie Carr and Willie Fitzgerald who have given the names of two of the 1959 Apprentices in the photo in the Gallery page. The new names are Donal Cummins and Michael Kerins. This leaves only two names missing. Can anyone help on this ? I listened with great interest to your radio interview last week and was very heartened to hear that approx. €4 billion of the €21 billion of taxpayers money used to bailout Allied Irish Bank will be recovered over the next 12 months or so. You also mentioned that there is also the prospect that 25% of the Government’s shareholding in AIB may be sold to recover further funds due to Irish taxpayers. This presents you with an ideal opportunity to repay some or all of the €2.4 billion unfairly and unjustly confiscated from Pensioners savings over the last 5 years, so I’m calling on you now Minister, to utilise those recovered funds to repay monies raided from Pension Funds. It is because your Government used such vast sums of money to bail out banks that you imposed such severe austerity measures on the Irish taxpayers. It is only right that the taxpayer should benefit from funds recovered from the banks. It was also reported in the National Media that the €2.4 billion confiscated from Pension funds surpassed all Government expectations by far exceeding amounts t originally anticipated. You have been rightly and severely criticised by Michael McGrath, Fianna Fail Finance spokesperson and I quote “The Government has presided over a disastrous Pensions strategy, failing to increase the level of pension coverage and raiding the savings of those who have put money aside for their retirement. The raid on private pensions has added to the difficulties of Pension Schemes already struggling to pay benefits that pensioners are entitled to”. So, Minister, do the decent thing and restore funds confiscated from these Pension Schemes. This may just prevent those already struggling from considering winding-up their Schemes. You have consistently evaded the real issues surrounding the Pension Levy. Your response, dated 30th July 2015, to my letter of 29th May 2015 is a typical example of this evasiveness, ignoring the fact that pensioners, as a group, have been penalised unduly and disproportionately by the imposition of this Levy. Please see below my letter of 3rd August 2015 to which I have still not received a response. Most commentators have described the Levy as unjust, unfair and a severe imposition on an already marginalised sector of society. This correspondence, along with all correspondence, sent/received to/from Government departments will be publicised on our website www.esbrsa.ie. Thank you for your response dated 30th July 2015 to my letter dated 29th May 2015. You have failed to address the main issue raised in my letter. Whether or not the Trustees of a Pension Fund decide to recover the cost of the Government Levy from Scheme members is not the main trust of my letter. The inherent injustice of the confiscation of Pensioners savings is the main issue here and the fact that this Government passed this outrageous legislation in 2011 to enable them to raid the savings of a weaker sector of society to the tune of €2.2 billion over a four year period. The raid on Pension Funds will be discontinued at the end of this year but many pensioners, however, are now coming to the realisation that they will pay the levy for the rest of their natural lives. This will be the current Government’s legacy and will be remembered by all who were affected by it. To add further insult, the Government are proposing to refund the pension levy on public sector staff and pensioners over the next few years and you have clearly stated in your response that you have no plans to reimburse the levy on private Pension Funds. This inequitable treatment of pensioners as a group is totally unacceptable. You have also targeted the elderly when you introduced measures in Budget 2013 that abolished the telephone allowance for OAP’s and the Bereavement Grant. You have introduced a five-fold increase in prescription charges since entering office and have reduced income thresholds for medical cards twice in that period. The Government have maintained that they have not reduced the State Pension yet since they came into office they have changed the qualifying criteria for the State Pension making it increasingly difficult for individuals to obtain a full pension. You have also removed tax relief for private medical insurance premiums, introduced charges in public hospital wards for those with private health insurance, which has substantially increased the cost of private health insurance making it impossible for many individuals to continue with private medical cover. These are election issues and I can assure you Minister, that they will be pursued vigorously in the coming months by ESB Retired Staff Association, who represent the interests of the majority of ESB’s 7,500 pensioners. May I also remind you, Minister, of the size of the “Grey Vote”. The CSO’s Population Growth Scenarios have predicted that 24% of the population will be over 60 in 2016, Election Year. This is more than 1 million, which translates to approx 33% of the total electorate of 3.2 million. The over 60’s are a sector of society who do actually vote in General Elections and will have the power to decide the overall outcome of the Election. Our Association will continue to publicise the real facts surrounding the Levy through our public website www.esbrsa.ie and through a multitude of other channels available to us. Just a note to update you with regard to some of my attempts over the past number of weeks to try and put pressure on the Government to intervene and address the injustices that remain regarding the IASS. The FEMPI legislation that was before the Dail, in relation to reinstating some of the cuts to public sector workers, was an opportunity I sought to use to table amendments on this issue. There was some discussion on these matters when the Bill was proposed, but my amendments (see below) were ruled out of order and were not permitted to be discussed, on the grounds that they would involve a cost to the Exchequer. Clearly they don’t care about the cost to existing and deferred pensioners! I have made some points below about the reason why I tabled these amendments and why they were important, in order that you can use some of this information with the Government parties in particular, when they come knocking on your door, that they failed to take this opportunity to address the inequity. There is a Finance Bill coming up in the next week and again I have tried to use some amendments as part of that bill to see can we get them to take action. In moving the latest FEMPI legislation the Government was eager to stress that it was ‘equitable’ to reverse the pay and pension cuts to the public sector now that the economy is, allegedly, back on track. It is equitable, and it is right, that pay and pension cuts that should never have been imposed in the first place are reversed. It remains inequitable that those cuts have not yet been fully reversed, and that so-called public sector ‘restructuring’ continues apace, as I noted at Second Stage of this Bill. What is profoundly inequitable is that people who spent large parts of their working lives in a company in which the State had a large stake are seeing no reversals in the massive cuts they have taken to their pensions over the past number of years. It’s bad enough that this Government made the unspeakably foolish move of selling off the State’s remaining stake in Aer Lingus – a sale that made no financial sense, a sale that was wholly and entirely unnecessary and which has left Ireland, the only country in Europe without a land link to the rest of the continent, without an airline – that’s bad enough. But for the same Government to do nothing to reverse the changes in brought about in 2009 that allowed current retired & deferred IASS members’ pensions be cut by up to 60%, and to do nothing to try and repair the hole in the IASS pension fund, is really too much. The amendments, therefore, seek to do something to right the wrong of that situation. It’s an acknowledgement that IASS pensioners, through the stamp duty levy imposed on their pension fund in 2011, have played a part in paying back into the public purse some of the money ripped out of it by the bank bailout. It acknowledges that now that tax receipts are up, it’s only fair that that money be returned to them. It’s also an acknowledgement that the effect of the stamp duty levy on IASS pensions didn’t end when the levy was abolished, and will be felt by pensioners forever if the Government doesn’t take some action. Importantly, it’s an acknowledgement that for people who spent many years working in the service of the State, a decimated pension is the most unjust of rewards. It’s totally unjust that anyone should see their pension destroyed, but it’s all the more upsetting when it’s pensioners who had a reasonable expectation that in working for the State they would be protected by that State in their old age. It’s an unspeakable state of affairs that that has not happened; and it’s just not good enough for this Government to not admit that, and do something about it. The Government must take responsibility for these pensioners. It must also take for the cuts, as it was changes to legislation that helped to bring things to this pass. While gross mismanagement of the fund’s assets was the most proximal cause of the cuts, the 2009 changes, the 2013 Social Welfare and Pensions Act, the State Airports (Shannon Group) Act, all compounded IASS members’ woes. It has been blow after blow after blow. And then on top of all of this is the stamp duty levy on private pension funds That 2.53% levy on the Aer Lingus pension fund will reduce the pensions of IASS pensioners forever – its abolition last year won’t make any difference to that. Because the levy was on the fund, it reduced the value of that fund. So what the levy has meant in practice is that there’s even less money to pay out of the fund to IASS members, something that abolition didn’t solve. The only way for the Government to do its bit to help pensioners who have already seen staggering drops in their incomes is to to return the money they collected from the fund to it. Some estimates put the reduction at €35 million. That’s €35 million contributed by IASS pensioners to the public purse. But while public sector pensioners are getting some of the money they contributed back, the IASS pensioners aren’t. This is deeply unfair, and these amendments seek to fix this. 12. All monies contributed to the Exchequer since 2011 by the imposition of the stamp duty pension levy on the IASS pension fund shall be returned to that fund before end-2016. ESB Staff Insurance have advised that when planning a holiday to call them before you travel to to clarify the position with regard to health cover on your Travel Insurance policy. This is to avoid any doubt with regard to health cover, particularly where there are any pre-existing medical conditions. To celebrate the 60th Anniversary of ESB Medical Provident Fund and to thank members for their continued support, a Grand Draw will be held on 18th November 2015. There will be a 1st Prize of a €1500 One4All Gift Card and two runner-up prizes of €250 Gift Cards. All current members on 1/11/2015 will automatically be included in the Draw – no entry is necessary. The winners will be notified by MPF after the Draw. Good Luck to all members and thank you again for contributing to the success of our Fund!! A new Menu item “Branch Notices” has been added in the top menu bar. To ask the Minister for Jobs, Enterprise and Innovation his plans to meet with an organisation (details supplied); and if he will make a statement on the matter. I, along with officials from my Department, met with the National Executive Committee of the ESB Retired Staff Association on July 27th last. At the meeting the Executive outlined their grievances in relation to collective representation access rights for retired persons on pension matters. I fully appreciate their concerns and those of retired and deferred members of pension schemes whose schemes are being restructured, particularly where such restructuring may impact on existing or potential pension benefits. It is important to bear in mind that the industrial relations system in Ireland is voluntary in nature both as regards access to the Labour Relations Commission and the Labour Court. Any change to that principle which would put in place a mandated right to be part of the process would alter fundamentally the conduct of industrial relations. As it stands, where changes to pension schemes are negotiated at company level whether as a result of a crisis in the scheme or otherwise, the outcome of that engagement cannot, of itself, change the pension scheme. Rather, any proposed changes to the scheme are effected through the trust deeds and rules of the scheme and are at the discretion of the parties so designated in the rules/deeds of the scheme. In terms of changes to pension schemes generally, the Trustees of a particular pension scheme are required by law to act in the best interests of all the members, be they active, deferred or pensioner members. Until recently, this has been done on an individual basis. The changes to the Regulations will require the trustees of a pension scheme to notify the groups representing the interests of retired and deferred scheme members where the trustees of a scheme propose to apply to the Pensions Authority to restructure scheme benefits under section 50 of the Pensions Act. This notification affords the representative group an opportunity to make a submission to the trustees of the scheme in relation to such proposals. The Regulations also give the representative group the right to appeal such a direction by the Pensions Authority to the High Court on a point of law. In my view it is within this framework, rather than through the State’s industrial relations machinery, that a collective approach should be effected. Arising from the meeting mentioned earlier, I have asked my officials to liaise further with the Association on the matter. To ask the Tánaiste and Minister for Social Protection her plans to meet with an organisation (details supplied); and if she will make a statement on the matter. – Sean Fleming. To ask the Tánaiste and Minister for Social Protection her plans to meet with an organisation (details supplied); and if she will make a statement on the matter. * For WRITTEN answer on Tuesday, 22nd September, 2015. Unfortunately, due to overall diary commitments, I am unable to meet the ESB Retired Staff Association (RSA) at this time. However, representatives of the ESB RSA have met with officials from the Department on a number of occasions where their concerns were put forward and discussed. I can assure you that I am aware, through briefings and updates given to me, of the concerns of the Association. Defined benefit schemes in Ireland are set up and maintained by employers on a voluntary basis. Defined benefit pension schemes in Ireland are generally set up under trust and, in that context, the trustees of a pension scheme are required to act in the best interest of all scheme members. I have no plans to bring forward amendments to the Pensions Act at this time and will continue to monitor the application of the Act on an ongoing basis. Today the number of page views on our website since it was set up in January 2015 exceeded 50,000 ! Again we thank all our visitors for their interest and support. Today the number of visitors to our website since it was set up in January 2015 exceeded 17,000 ! We thank all our visitors for their interest and support. NEW PHOTOS POSTED IN GALLERY PAGE ! I wish to follow up on some issues raised at the recent Medical Provident Fund AGM on behalf of ESB Retired Staff Association (ESBRSA). John Nugent, who represented ESBRSA at the meeting, raised the issue of the level of reserves (€41 million) currently held by the Fund. The current minimum legal requirement for the Fund is a reserve level of €9 million. The original intention behind the Fund carrying reserves in excess of the minimum legal requirement was to set up an “Age Reserve” with a view to protecting Fund members against subscription increases when the age profile of the membership increased in later years and to hold those funds in reserve for the “rainy day”. We believe that the “rainy day” has now arrived and that the excess reserves should now be used to subsidise subscription increases in future years. Many ESB pensioners are finding it difficult to maintain their MPF cover due to the fact that they are on fixed incomes for the past 7 years. They have not received a pension increase in that period and have been hit by many Government imposed charges such as property tax, water charges, USC and the Government Pensions Levy on Pension Funds which the ESB Pension Fund Trustees have decided to recover exclusively from ESB pensioners thus reducing their pensions for their remaining lifetimes. You indicated at the AGM that you and the MPF Trustees would investigate the practicalities of utilising the reserves in the manner suggested above in an effort to alleviate any further financial pressure on retired members. The other issue raised at the AGM was in relation to MPF cover for members if they were hospitalised when they were holidaying abroad. This issue was also raised at the AGM in Ennis last year and our Association’s understanding from that meeting was that each case would be taken individually, but if members required hospital treatment abroad that, as a general rule, they would enjoy the same level of cover from MPF as they did when at home in Ireland. There was conflicting information supplied at this years’ AGM with regard to cover abroad. I would appreciate clarification on this issue as some members may go abroad for extended periods and would need to know what MPF cover hay have. Members of the MPF office team will be in attendance in ESB offices, Swift Square, Santry on Thursday 22nd October 2015. We would be delighted to help with any query and provide whatever assistance is possible. Also there will be a draw for 2 IPOD shuffles on the day and all who attend will be entered in this draw. Venue : ESB, Swift Square, Santry, DUBLIN. ESB Staff Medical Provident Fund is a non-profit contributory medical insurance scheme founded in 1955 for ESB members and their families. In conjunction with the 60th Anniversary of the Fund, 2 members of staff from their Limerick office will attend ESB Portlaoise to meet with Fund members and prospective members to discuss any health insurance issues which they may have. Time ? 10.30 – 12.30 a.m. There will also be upcoming visits in the next few weeks to ESB Santry, ESB Moneypoint and ESB Limerick. ……..Details to be announced. The Internal Market held on 24 September 2015 has now been completed. (the Market Price) and this is the price that will be paid to all successful sellers. partially successful and sold some of the shares offered. PwC will be writing to all successful and partially successful sellers and bidders. the week beginning 12 October 2015. ESB Occupational health, in conjunction with the EAP Officers, provides a flu vaccination programme to all Active/VSS/retired staff and a small number of spouses every year. This service is free to active/VSS/retired staff, with spouses/civil partners paying just €20.The charge is simply deducted from the ESB staff member’s salary and makes preparing for winter even more affordable. Occupational health urges everyone to take advantage of this service, and has teamed up with Boots pharmacies to provide the programme via a handy voucher-based system. Vouchers can be requested from the HR Customer Support Centre by email: OneHR@esb.ie or by phone: 01 7026699 Option 3. An ESB staff member can request an additional voucher for their spouse/civil partner, too. If you’re unable to attend a Boots Pharmacy, you may be considered for a GP refund, though, you can simply attend your local GP and submit a refund of up to €25. It’s worth noting that spouses and civil partners are not eligible for this refund. We bring you the following information by kind permission ESB EM regarding the details of our Departed Friends as published in the staff newspaper EM. Thank you for your response to my letter dated 13th July 2015 with regard to the ESB Employee Share Ownership Plan (ESOP). ESBRSA accept your contention that you do not have a function in the workings of the ESOP Internal Market. That is a matter for the ESOP Trustees. However, as Minister for Communications Energy and Natural Resources and holder of 10 % of ESB Capital Stock you did have a function in approving the joint proposals submitted from both ESB & ESB Group of Unions as joint sponsors of ESOP. As stated in my letter of 13th July, the main problem with the operation of the Internal Markets has been the lack of liquidity and thus the ability to offer fair value to participants for their shares. ESB sought approval from both your department and the Minister for Public Expenditure and Reform, as owner of 85% of ESB Capital Stock, to participate in the Internal Market in conjunction with the ESOP Trustee in order to provide much needed liquidity. ESB Retired Staff Association (ESBRSA) have been very reliably informed that both your Department and the Department of Public Expenditure and Reform placed severe restrictions on ESB’s participation in the Market and placed an upper limit of €25 million on the funds to be provided by the Company and insisted that the Company’s participation was conditional that all shares purchased by ESB would be cancelled and returned to ESB and consequently Government ownership. The former ESB Chairman, Lochlann Quinn, advocated a share valuation based on the Net Asset Value of ESB as the fairest and most transparent method, a method of valuation also favoured by our Association. Under that method the share value would be €1.86 per share based on the 2014 ESB Annual Accounts. ESBRSA are also very reliably informed that the former ESB Chairman’s proposal was rejected by both Government Departments on grounds of cost. It would have required an injection of approx. €50 million by the Company to achieve that valuation per share. The Market will now operate under the proposed changes which are somewhat of an improvement on previous Market rules but do not go far enough to allay the concerns of retired staff. Due to Government imposed restrictions the “Fair Market Valuation” has fallen very much short of expectations. Retired staff however, are still very much disadvantaged in that they are still forced to sell their shares in a market that will not offer them “Fair Value” for their shares and any shares purchased by the ESOP Trustee using dividend monies from participants’ unappropriated shares will be redistributed to serving staff only. This lack of fairness to retired staff is mainly due to the restrictions that you, and your colleague, Minister Howlin have placed on ESB in the amount of funds they can utilise in buying shares in the market. You are both members of the Labour Party, a party which, supposedly, champions the rights of workers and you have denied ESBRSA members a fair deal under these new proposals. Your letter of 31st August 2015 was patronising, to say the least, and attempted to deny the reality that you and your colleague, Minister Howlin are directly responsible for the situation that now exists with regard to the Internal Market. ESBRSA would welcome a meeting with both you and Minister Howlin in order to provide all parties with an opportunity to put forward their respective views on these matters. take part in the market. Page View total now exceeds Forty Thousand (40,000) since the website began !!! A document with a summary of TDs replies to the letter seeking Support for PENSION LEVY REFUND is now available in the Lobbying Campaign post at left of screen. The following letter dated 10th August is correspondence re the Protest Letter handed in to Tanaiste & Minister for Social Protection on March 3rd 2015. The original Protest Letter is below. It confirms that the Pension Levy will apply to our pensions for life !!! The Minister for Finance, Mr Michael Noonan TD, has asked me to respond to your correspondence regarding the pension fund levy. The Minister confirmed in his Budget 2015 speech that the final 0.15% levy will expire at the end of 2015. The chargeable persons for the pension fund levy are the trustees or other persons (including insurance companies) with responsibility for the management of the assets of the pension schemes or plans. The payment of the levy is treated as a necessary expense of a pension scheme and the trustees or insurer, as appropriate, are entitled, where they decide to do so, to adjust current or prospective benefits payable under a scheme to take account of the levy. It is up to the trustees to decide whether and how the levy should be passed on and who should be impacted and to what extent, given the particular circumstances of the pension schemes for which they are responsible. While the levy itself will expire at the end of 2015 the manner in which the trustees choose to pass it on may entail a longer term but lesser reduction in pension payments. However, should the option of reducing scheme benefits be taken, in no case may the reduction in an individual member’s or class of member’s benefits exceed the member’s or class of member’s share of the levy. While the final pension fund levy will be ceased as outlined, the Minister has no plans to repay the pension fund levy collected as you suggest. The value of the funds raised by way of the levy have been used to protect and create jobs and this has helped to create the improving financial and economic position of the State. Taxpayers to whom the impact of the levy may have been passed on by the chargeable persons for the levy will benefit from the changes which the Minister began in Budget 2015 and which will continue in future Budgets to reduce the tax burden on low and middle income earners. I am writing to you yet again on behalf of the members of the ESB Retired Staff Association regarding the Government Pensions Levy and the impact that this levy has had and will have into the future on those members. There has been much publicity in the media regarding the Minister for Public Expenditure & Reform’s engagement with Public Service Unions to discuss the reversal of pay cuts and pensions levy for Public Servants yet there has been little said about the €2 billion that the levy on private pensions has contributed to the Exchequer in the last 4 years. To put that amount in perspective, it would be more than what the Property Tax and Water Charges combined would yield in a similar period. This was the greatest “smash and grab” raid by the Government in the history of the State on the savings of pensioners, one of the most vulnerable sectors of society, a sector that does not have a “voice” or access to Government as Public Sector Unions do. The only publicity that the Levy of private pensions has received is the fact that it is being abolished at the end of 2015. Many TD’s are heralding the end of the Pensions Levy but unfortunately the effects of this Levy on members of Private Pension Schemes will be life-long. The assets of Pensions Schemes have been permanently reduced as a direct consequence of the Levy resulting in members pensions being significantly reduced by Trustees to recover the cost of the Levy. These reductions in pensions will be for the members lifetime so there will be a constant reminder for pensioners on their monthly payslip. When a member dies – as a married person – the spouse is then burdened with this unfair Levy. As far as pensioners are concerned this Governments legacy will be the Pensions Levy and other Budgetary measures that targeted the elderly, such as the abolition of the Telephone Allowance and the Bereavement Grant. I put it to you, Minister, that in light of the continuing economic recovery that restoration of this Levy should be given serious consideration and Pension Schemes be reimbursed with the amounts confiscated from their Funds. Members of Private Pension Schemes may not have a “voice” or access to Government Ministers but they do have a vote, and, in the absence of any plans to restore the assets of Pension Funds, I expect that a clear message will be sent through the ballot box. I wish to thank you and your officials for taking the time to meet with members of the Executive Committee of the ESB Retired Staff Association (ESBRSA) on Monday 27th July 2015 at your office in Kildare Street. I also wish to thank you for your commitment that you and your officials will investigate the serious concerns that ESBRSA have regarding official recognition of our Association and our right to officially represent our members in discussions and negotiations with our former Employer, ESB. Our discussion on the day was wide ranging, including access for “former workers” to the State’s Industrial Relations Machinery, our Association’s recent experience with the Equality Tribunal, Labour Court & Pensions Authority and the Tanaiste’s recent initiative granting collective representation rights to pensioners when a Section 50 application has been made to the Pensions Authority by Trustees of a Pension Scheme. The specific circumstances that you agreed to investigate is where an Actuarial Valuation of ESB Pension Scheme reports a deficit in the Pension Scheme, or any other situation where a deficit in the Scheme is reported, that ESBRSA representing the majority stakeholder (66%) in the Pension Scheme will have the right to enter talks, along with the other stakeholders, ESB, and the ESB Unions representing serving staff, to address a Scheme deficit. This situation where a deficit was reported in the Pension Fund has already arisen in recent years. In 2010 ESB and ESB Unions entered into an Agreement/Arrangement on pensions to the exclusion of pensioners to address a Scheme deficit. The resulting Agreement, to which ESBRSA, representing pensioners, had absolutely no input, greatly disadvantaged pensioners as a group. This Agreement reneged on” Pension Promises” given by former Chief Executives and Senior Managers to pensioners, who, under the terms of the 2010 Agreement, were subjected to an “indefinite pay freeze” making an increase conditional on the Fund passing a solvency test, and breaking the traditional link between staff salaries and pensions. ESBRSA also believe that this agreement entered into by these two parties is detrimental to pensioners who were not party to the agreement and is unconstitutional as demonstrated in a previous Supreme Court Ruling in relation to Registered Employment Agreements (REAs) i.e. It is unconstitutional for two private parties to make an agreement which attempts to be binding on a third party when that third party was not party to the original agreement. As former ESB workers, our contract of employment is with ESB. 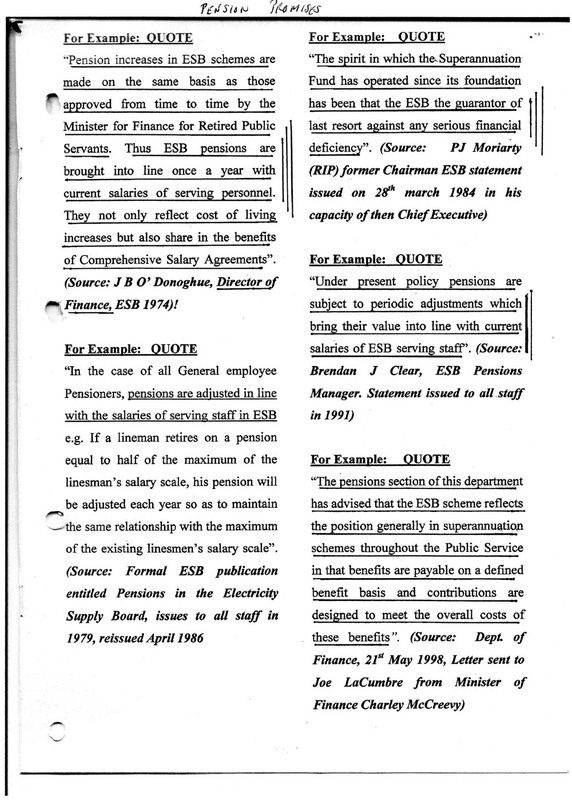 It was a condition of employment in ESB that permanent staff were required to become members of the Pension Scheme. This was not a discretionary matter for staff and the age at which one was required to join was specified. ESB pensioners have also contributed in full for their pensions for 40+ years and in some cases 45 years+. Those contributions together with Employer contributions are held in Trust by the Trustees of the Pension Scheme to invest and manage on behalf of Scheme members. They are, in effect, the property of the Scheme member and to deny members, or the mandated representatives of those members, the right to enter discussions/negotiations where the management of the Pension Scheme Assets are the subject of those discussions is an infringement of the property rights of those members and is therefore, unconstitutional. The right to engage meaningfully with an Employer and the Trustees of an associated pension scheme is the very essence of pensioner grievance. Pensioner representatives, as of right, should be afforded meaningful equality of esteem with Unions representing workers, by having formal input to any or all discussions or negotiations that may bear on pension entitlements – entitlements that flow from the collectively agreed industrial relations employment contract that bound us throughput our working careers and continues to collectively bind us in retirement. We hope that you will take careful note of the issues raised at our meeting and in this letter when you consider their implications, and investigate the setting up of a mechanism to deal with our grievances as outlined above. I look forward to hearing from you and a positive outcome to your investigation. A document with a summary of TDs replies to the letter seeking Support for ESBRSA issues is now available in the Lobbying Campaign post at left of screen. Clarification on the allocation of shares acquired by the Trustee on the Internal Market. The rules provide that shares acquired by the Trustee in this manner will be either notionally allocated to current employee participants with the required qualifying service at the time of allocation or re-sold on future markets. Retired/former employee participants will not receive notional allocations of such shares. ESBRSA LOBBYING CAMPAIGN HAS GONE LIVE !!! I refer to your letter dated 13 July 2015 addressed to the ESOP Chairman, a copy of which will be circulated to the Trustee Board. I refer to your letter dated 13 July 2015 addressed to the ESOP Chairman, a copy of which will be circulated to the Trustee Board. As you are aware, ESOP participants are currently voting on the proposed Internal Market amendments set out in the Trustee’s 25 June 2015 communication to participants and discussed at the recent information sessions. The package of amendments will be accepted or rejected by a simple majority of the votes cast. The Trustee will notify all participants of the ballot result in due course. As you are aware, ESOP participants are currently voting on the proposed Internal Market amendments set out in the Trustee’s 25 June 2015 communication to participants and discussed at the recent information sessions. The package of amendments will be accepted or rejected by a simple majority of the votes cast. The Trustee will notify all participants of the ballot result in due course. I’m writing to you on behalf of the ESB Retired Staff Association (ESBRSA) with regard to the proposed amendments to the rules of ESB Employee Share Ownership Plan (ESOP). I’m writing to you on behalf of the ESB Retired Staff Association (ESBRSA) with regard to the proposed amendments to the rules of ESB Employee Share Ownership Plan (ESOP). Following the series of ESOP information sessions which were attended by representatives of the ESBRSA National Executive we wish to highlight how grossly unfair the proposed amendments are to retired staff. Following the series of ESOP information sessions which were attended by representatives of the ESBRSA National Executive we wish to highlight how grossly unfair the proposed amendments are to retired staff. The ESOP was set up as part of the CCR Agreement in the mid 90’s and the 5% shareholding was awarded to staff in lieu of a salary increase. In excess of 2,000 staff left the Company in the years following that Agreement. The staff delivered on their part by way of increased productivity and ESB made enormous cost savings. It is extremely disappointing that ESB can only make a €25 million commitment over 4 years. In the context of the productivity conceded by staff under CCR this is a paltry amount. The ESOP was set up as part of the CCR Agreement in the mid 90’s and the 5% shareholding was awarded to staff in lieu of a salary increase. In excess of 2,000 staff left the Company in the years following that Agreement. The staff delivered on their part by way of increased productivity and ESB made enormous cost savings. It is extremely disappointing that ESB can only make a €25 million commitment over 4 years. In the context of the productivity conceded by staff under CCR this is a paltry amount. Those same staff are now retired and comprise at least 60% of ESOP participants. They do not have a voice and do not have representation on the ESOP Board. They are the ones who have been severely disadvantaged by the operation of the Internal Markets to date. Trade Unions do not represent the interests of retired staff. ESBRSA are the only properly constituted body representing the interests of the majority of ESB’s 7,500 pensioners and have a mandate from their members to do so. Those same staff are now retired and comprise at least 60% of ESOP participants. They do not have a voice and do not have representation on the ESOP Board. They are the ones who have been severely disadvantaged by the operation of the Internal Markets to date. Trade Unions do not represent the interests of retired staff. ESBRSA are the only properly constituted body representing the interests of the majority of ESB’s 7,500 pensioners and have a mandate from their members to do so. Retired staff are now in a position that under current ESOP rules they are forced to sell their shares. In the interest of fairness and equity they should get “Fair Value” for their ESB shares. The former Chairman, Lochlann Quinn, advocated a valuation of shares based on the Net Asset value of ESB and using the figures in the 2014 accounts this values each share at €1.86. This was rejected by Government and given the restrictions they have imposed on ESB’s capacity to participate in the markets it pre-determines a relatively low Fair Market Value range. Retired staff are now in a position that under current ESOP rules they are forced to sell their shares. In the interest of fairness and equity they should get “Fair Value” for their ESB shares. The former Chairman, Lochlann Quinn, advocated a valuation of shares based on the Net Asset value of ESB and using the figures in the 2014 accounts this values each share at €1.86. This was rejected by Government and given the restrictions they have imposed on ESB’s capacity to participate in the markets it pre-determines a relatively low Fair Market Value range. ESB staff bought into the ESOP as part of the CCR Productivity Agreement and accepted the 5% shareholding in lieu of a salary increase in the expectation of receiving considerable rewards from their shares. If, on the other hand, they had opted for the salary increase, the cost to ESB by way of increased salary costs and pension contributions since 1996 when CCR was concluded would have been enormous in comparison to the prospect of what is now being offered for shares. ESB staff bought into the ESOP as part of the CCR Productivity Agreement and accepted the 5% shareholding in lieu of a salary increase in the expectation of receiving considerable rewards from their shares. If, on the other hand, they had opted for the salary increase, the cost to ESB by way of increased salary costs and pension contributions since 1996 when CCR was concluded would have been enormous in comparison to the prospect of what is now being offered for shares. Letters have also been sent to Chairman of ESOP Trustees and the Ministers for Public Expenditure and Reform and Communications, Energy & Natural Resources. Copies of all correspondence will be on our website www.esbrsa.ie for our members’ information. Letters have also been sent to Chairman of ESOP Trustees and the Ministers for Public Expenditure and Reform and Communications, Energy & Natural Resources. Copies of all correspondence will be on our website www.esbrsa.ie for our members’ information. I would appreciate a reply as a matter of urgency. I’m writing to you on behalf of the ESB Retired Staff Association (ESBRSA) with regard to the proposed amendments to the rules of ESB Employee Share Ownership Plan (ESOP). 1. ESOP will spend €25 million of participants dividend monies in addition to the €8 million already spent on buying shares to support future Markets. 1. ESOP will spend €25 million of participants dividend monies in addition to the €8 million already spent on buying shares to support future Markets. 2. Retired staff will not benefit from the re-allocation of €33 million worth of shares despite the fact that their dividend monies have been used to buy those shares. Each member of current staff will gain approx. €7,000 worth of shares in this re-allocation. 2. Retired staff will not benefit from the re-allocation of €33 million worth of shares despite the fact that their dividend monies have been used to buy those shares. Each member of current staff will gain approx. €7,000 worth of shares in this re-allocation. 3. Participants are expected to vote on proposals without knowing the most important element i.e. The Fair Market Value (FMV) of shares. 3. Participants are expected to vote on proposals without knowing the most important element i.e. The Fair Market Value (FMV) of shares. 4. Restrictions imposed by Government on ESB’s capacity to participate in the markets pre-determines a relatively low Fair Market Value range. 4. Restrictions imposed by Government on ESB’s capacity to participate in the markets pre-determines a relatively low Fair Market Value range. 5. The “forced sellers” rule continues to apply to retired staff. 5. The “forced sellers” rule continues to apply to retired staff. 6. No priority given to leavers over other sellers in years 1-3 of the sale period. 6. No priority given to leavers over other sellers in years 1-3 of the sale period. 7. If amendments are carried the next market will be the first forced sale market thus denying retired staff a third market with an option to specify a minimum reserve price on their shares. 7. If amendments are carried the next market will be the first forced sale market thus denying retired staff a third market with an option to specify a minimum reserve price on their shares. 8. There is the big question of where will ESOP get funds to purchase shares to support the Markets in 2017 & 2018 when they won’t have access to dividend monies. 8. There is the big question of where will ESOP get funds to purchase shares to support the Markets in 2017 & 2018 when they won’t have access to dividend monies. 9. There is a commitment to review the process in 2018 but there is no commitment from any of the parties as to what mechanism will be put in place to support the markets for the sale of the balance of shares which will be appropriated no later than 14th December 2016. 9. There is a commitment to review the process in 2018 but there is no commitment from any of the parties as to what mechanism will be put in place to support the markets for the sale of the balance of shares which will be appropriated no later than 14th December 2016. There were questions raised at the information sessions regarding the validity of the ESOP Trustees right to use participant’s dividend monies to support the markets. Regardless of the tax implications for participants on receiving dividend monies from unappropriated shares, the principle of ESOP Trustees using that money is wrong and very questionable. There were questions raised at the information sessions regarding the validity of the ESOP Trustees right to use participant’s dividend monies to support the markets. Regardless of the tax implications for participants on receiving dividend monies from unappropriated shares, the principle of ESOP Trustees using that money is wrong and very questionable. The question of ESOP accounting for all income and expenditure was raised. Attendees were informed that accounts were available in the ESOP office. In the interests of full transparency this information should have been automatically provided to all participants on an ongoing basis. It could have been sent as an insert with any of the regular communications to participants at no extra cost. The question of ESOP accounting for all income and expenditure was raised. Attendees were informed that accounts were available in the ESOP office. In the interests of full transparency this information should have been automatically provided to all participants on an ongoing basis. It could have been sent as an insert with any of the regular communications to participants at no extra cost. I would be grateful of an urgent response to the above issues. I would be grateful of an urgent response to the above issues. This letter will be published on our website www.esbrsa.ie for members’ information. I’m writing to you on behalf of the ESB Retired Staff Association (ESBRSA) and with regard to the ESB Employee Share Ownership Plan (ESOP). Your Department has been involved directly in the talks and negotiations process on finding a solution to the problems surrounding the operation of the Internal Markets for the sale of ESB shares held by participants of ESOP. Your role in the process has become very clear following a series of ESOP information briefings on the details of the proposed amendments to the ESOP rules on the operation of the Internal Markets. Your Department has been involved directly in the talks and negotiations process on finding a solution to the problems surrounding the operation of the Internal Markets for the sale of ESB shares held by participants of ESOP. Your role in the process has become very clear following a series of ESOP information briefings on the details of the proposed amendments to the ESOP rules on the operation of the Internal Markets. The main problem with the operation of the Internal Markets has been the lack of liquidity and thus the ability to offer fair value to participants for their shares. As Minister for Public Expenditure and Reform and owner of 80% of ESB Capital Stock you have been instrumental in restricting or curtailing the funds that ESB can spend to a total of €25 million over the next 4 years to provide badly needed liquidity in the Markets. Consequently, you are denying ESB retired staff fair value for the shares they are forced to sell in future markets. The main problem with the operation of the Internal Markets has been the lack of liquidity and thus the ability to offer fair value to participants for their shares. As Minister for Public Expenditure and Reform and owner of 80% of ESB Capital Stock you have been instrumental in restricting or curtailing the funds that ESB can spend to a total of €25 million over the next 4 years to provide badly needed liquidity in the Markets. Consequently, you are denying ESB retired staff fair value for the shares they are forced to sell in future markets. The method of valuation favoured by our Association and the former ESB Chairman, Lochlann Quinn, is the Net Asset Value of ESB. This is the fairest and most transparent method with figures readily available in ESB’s Annual Report. Under that method the share value would be €1.86 per share based on the 2014 ESB Annual Accounts. This was advocated by the former ESB Chairman and submitted to your Department for approval immediately prior to his departure from ESB. Your Department rejected the Chairman’s submission on the share valuation. The method of valuation favoured by our Association and the former ESB Chairman, Lochlann Quinn, is the Net Asset Value of ESB. This is the fairest and most transparent method with figures readily available in ESB’s Annual Report. Under that method the share value would be €1.86 per share based on the 2014 ESB Annual Accounts. This was advocated by the former ESB Chairman and submitted to your Department for approval immediately prior to his departure from ESB. Your Department rejected the Chairman’s submission on the share valuation. The restriction that you have placed on ESB spending limit severely restricts the ESOP Trustees ability to offer participants what is perceived to be “Fair Value” for the shares that they are forced to sell. You have also placed a condition on ESB’s participation in future Markets that all shares purchased by ESB would be cancelled and revert to ESB ownership, thereby reducing the Employee shareholding and increasing ESB/Governments holding. The restriction that you have placed on ESB spending limit severely restricts the ESOP Trustees ability to offer participants what is perceived to be “Fair Value” for the shares that they are forced to sell. You have also placed a condition on ESB’s participation in future Markets that all shares purchased by ESB would be cancelled and revert to ESB ownership, thereby reducing the Employee shareholding and increasing ESB/Governments holding. You have the audacity to call yourself a member of the Labour Party, a party which champions the rights of workers. ESB staff bought into the ESOP as part of a Productivity Agreement in the mid 1990’s and delivered their part of the Agreement. ESB achieved huge cost savings as a result of the Agreement and the staff who delivered that productivity, now retired, want a fair price for their shares. You Minister, have denied them that right. You have the audacity to call yourself a member of the Labour Party, a party which champions the rights of workers. ESB staff bought into the ESOP as part of a Productivity Agreement in the mid 1990’s and delivered their part of the Agreement. ESB achieved huge cost savings as a result of the Agreement and the staff who delivered that productivity, now retired, want a fair price for their shares. You Minister, have denied them that right. SINCE STARTING ON JANUARY 21ST 2015 !!! Two RSA officers had an informal meeting with ESB Group Pensions Manager James O’Loughlin on Monday 6th July. Two RSA officers had an informal meeting with ESB Group Pensions Manager James O’Loughlin on Monday 6th July. He was accompanied by Paul Duignan ESB Pensions Services Manager. He was accompanied by Paul Duignan ESB Pensions Services Manager. A formal meeting will take place with the full complement of RSA officers at end of August 2015. A formal meeting will take place with the full complement of RSA officers at end of August 2015. Why are there letters from ESB & ESB Group of unions supporting the proposed amendments included yet there is no comment or anybody speaking on behalf of retired staff who comprise more than 60% of participants? Why are there letters from ESB & ESB Group of unions supporting the proposed amendments included yet there is no comment or anybody speaking on behalf of retired staff who comprise more than 60% of participants? Why are Participants expected to vote on proposals without knowing the most important element i.e. The Fair Market Value (FMV) of shares? Why are Participants expected to vote on proposals without knowing the most important element i.e. The Fair Market Value (FMV) of shares? ESOP will spend €25 million of participants dividend monies in addition to the €8 million already spent on buying shares to support the Market. These shares will only be re-allocated to serving staff as per the rules that currently apply. This re-allocation of €33 million worth of shares would equate to €7,000 worth of shares for each member of current staff. This is grossly unfair and not acting in the best interests of all participants. Why weren’t the rules amended to include retired staff in this re-allocation? ESOP will spend €25 million of participants dividend monies in addition to the €8 million already spent on buying shares to support the Market. These shares will only be re-allocated to serving staff as per the rules that currently apply. This re-allocation of €33 million worth of shares would equate to €7,000 worth of shares for each member of current staff. This is grossly unfair and not acting in the best interests of all participants. Why weren’t the rules amended to include retired staff in this re-allocation? Why was the “forced sellers” rule not abolished when amendments were being discussed with Government Depts? Why was the “forced sellers” rule not abolished when amendments were being discussed with Government Depts? The balance of shares will be appropriated no later than 14th December 2016. Where will ESOP get funds to purchase shares to support the Markets in 2017 & 2018 and what reserves do ESOP currently hold as accounts have never been furnished by ESOP to participants? The balance of shares will be appropriated no later than 14th December 2016. Where will ESOP get funds to purchase shares to support the Markets in 2017 & 2018 and what reserves do ESOP currently hold as accounts have never been furnished by ESOP to participants? There are almost 100 million units of ESB Capital Stock vested in ESOP of which approx. 50 Million have been appropriated to participants. It appears that the Minimum Reserve Price (MRP) won’t deviate much from €1 per share given the restrictions imposed by Government on how much ESB can spend in acquiring shares in the Markets. Why has there been a spending limit impose by Government, It predetermines what the MRP will be? There are almost 100 million units of ESB Capital Stock vested in ESOP of which approx. 50 Million have been appropriated to participants. It appears that the Minimum Reserve Price (MRP) won’t deviate much from €1 per share given the restrictions imposed by Government on how much ESB can spend in acquiring shares in the Markets. Why has there been a spending limit impose by Government, It predetermines what the MRP will be? ESBRSA recommended using the Net Asset Value of ESB to value the shares. The figures are readily available from ESB’s Annual Report and based on the 2014 report the Net Asset Value per share is €1.86. This is a more transparent way of valuing shares and a much fairer way for all participants. ESBRSA recommended using the Net Asset Value of ESB to value the shares. The figures are readily available from ESB’s Annual Report and based on the 2014 report the Net Asset Value per share is €1.86. This is a more transparent way of valuing shares and a much fairer way for all participants. The debate on the IR bill was in the dail last Thursday July 2nd. The debate on the IR bill was in the dail last Thursday July 2nd. All the amendments sought were ignored and outvoted. All the amendments sought were ignored and outvoted. MEETING WITH ESB AGREED FOR 23RD JUNE POSTPONED BY ESB ! The ESB promised next meeting scheduled for June 23rd with the four RSA officers was postponed Friday JUNE 19TH, by ESB, until 30th July 2015. REMINDER TO GOVERNMENT MINISTERS ! Four RSA Officers had a two and a half hours meeting 9th June with ESB Personnel representing the Chief Executive and ESB Board. Four RSA Officers had a two and a half hours meeting 9th June with ESB Personnel representing the Chief Executive and ESB Board. There was good exchange and interaction between the parties. There was good exchange and interaction between the parties. This was as a direct result of the RSA protest outside ESB H/O on 3rd March, protest letters to ESB Chief Executive and separately to individual ESB Board members. This was as a direct result of the RSA protest outside ESB H/O on 3rd March, protest letters to ESB Chief Executive and separately to individual ESB Board members. The Board then responded via the Chief Executive by letter to RSA on 29th April and promised a meeting, which took place yesterday. The Board then responded via the Chief Executive by letter to RSA on 29th April and promised a meeting, which took place yesterday. A further meeting is scheduled with ESB for Tuesday 23rd June 2015. (These meetings are separate to ‘The Way Forward’ forum). A further meeting is scheduled with ESB for Tuesday 23rd June 2015. (These meetings are separate to ‘The Way Forward’ forum). ESBRSA has received a reply from Chief Executive ESB Mr. Pat O’Doherty dated 29th April, 2015, to our Letter of 3rd March and subsequent letter of April, 17th to Acting ESB Chairman Ms Ellvena Graham. ESBRSA has received a reply from Chief Executive ESB Mr. Pat O’Doherty dated 29th April, 2015, to our Letter of 3rd March and subsequent letter of April, 17th to Acting ESB Chairman Ms Ellvena Graham. to the Data Protection Commissioner for clarification. to the Data Protection Commissioner for clarification. without their permission. Hopefully we get a positive response. without their permission. Hopefully we get a positive response. I will copy you with the response immediately I receive it. I will copy you with the response immediately I receive it. UPDATE 29th MAY, 2015 ! ESBRSA encourages all members who are ESOP Participants to write to ESOP Chairman and Trustee Board Members using the above letter as a template to ask the questions in a personal capacity as shareholders. ESBRSA encourages all members who are ESOP Participants to write to ESOP Chairman and Trustee Board Members using the above letter as a template to ask the questions in a personal capacity as shareholders. UPDATE 24th MAY, 2015 ! RESPONSE TO DATE = Acknowledgement to RSA letters to Pensions Manager of 3rd March & 13th April received in post 18th May. RESPONSE TO DATE = Acknowledgement to RSA letters to Pensions Manager of 3rd March & 13th April received in post 18th May. ESBRSA has received a reply from Chief Executive ESB Mr. Pat O’Doherty dated 29th April, 2015, to our Letter of 3rd March and subsequent letter of April, 17th to Acting ESB Chairman Ms Ellvena Graham. Nationally – Jack O’Connor SIPTU, Eamon Devoy TEEU, Jimmy Kelly UNITE and Fran O’Neill ESU. Nationally – Jack O’Connor SIPTU, Eamon Devoy TEEU, Jimmy Kelly UNITE and Fran O’Neill ESU. Locally – Jimmy Nolan Acting Secretary ESB GOU, Adrian Kane c/o GOU and Richie Brown c/o GOU. Locally – Jimmy Nolan Acting Secretary ESB GOU, Adrian Kane c/o GOU and Richie Brown c/o GOU. Seperately, individual letters were posted to the ESB Chair and ESB Chief Executive with a copy to all above Union individuals. Seperately, individual letters were posted to the ESB Chair and ESB Chief Executive with a copy to all above Union individuals. The National Executive Committee (NEC) Chairman Tony Collins and NEC Secretary Michael MacNamara attended the Lanesboro Branch AGM on Wednesday 15th April. There was a very informative information session followed by a very active Q & A session. The National Executive Committee (NEC) Chairman Tony Collins and NEC Secretary Michael MacNamara attended the Lanesboro Branch AGM on Wednesday 15th April. There was a very informative information session followed by a very active Q & A session. Thanks to Brendan Whitty (Treasurer) Lanesboro for the photo. Thanks to Brendan Whitty (Treasurer) Lanesboro for the photo. ___________________________________________________________ See new MEDIA RELEASE (2) Re Promises to Pensioners 12 APRIL, 2015. In Response to Letters of Protest a meeting between ESBRSA and Officials from Department of Jobs Enterprise and Innovation took place on Wednesday 8 april, 2015 ! In Response to Letters of Protest a meeting between ESBRSA and Officials from Department of Jobs Enterprise and Innovation took place on Wednesday 8 april, 2015 ! MORE THAN 700 PENSIONERS PROTESTED ! Representatives from ESB accepted these letters at ESB HO Reception. Representatives from ESB accepted these letters at ESB HO Reception. An attempt to deliver a Protest Letter to Chairman ESB ESOP at the office at 43 Merrion Square was met by an unanswered door with a Brinks security guard visible in the hallway. An attempt to deliver a Protest Letter to Chairman ESB ESOP at the office at 43 Merrion Square was met by an unanswered door with a Brinks security guard visible in the hallway. ESBRSA will send this Protest Letter by Registered Mail as no other communication means appears possible. ESBRSA will send this Protest Letter by Registered Mail as no other communication means appears possible. of the Minister of Public Expenditure & Reform Brendan Howlin (Who holds 85% of ESB Share Stock) met with us and the letter will be sent by Registered Mail. of the Minister of Public Expenditure & Reform Brendan Howlin (Who holds 85% of ESB Share Stock) met with us and the letter will be sent by Registered Mail. All of the above Protest Letters are available in the ABOUT – MEDIA RELEASES SECTION on this website and below. All of the above Protest Letters are available in the ABOUT – MEDIA RELEASES SECTION on this website and below. RESPONSE TO DATE = A SINGLE LETTER DATED 24TH APRIL, 2015, ACKNOWLEDGING RECEIPT OF RSA LETTERS OF 3RD MARCH, 13TH APRIL & 17TH APRIL, 2015 HAS BEEN RECEIVED. RESPONSE TO DATE = A SINGLE LETTER DATED 24TH APRIL, 2015, ACKNOWLEDGING RECEIPT OF RSA LETTERS OF 3RD MARCH, 13TH APRIL & 17TH APRIL, 2015 HAS BEEN RECEIVED. 35-39 LOWER ABBEY STREET, DUBLIN 1, ON THURSDAY 11th JUNE 2015 AT 14:00. Tuesday 2nd June 2015 in Menlo Park Hotel, Headford Road, Galway at 10.30 AM. THE AGM OF DUBLIN H.O. BRANCH OF ESBRSA TOOK PLACE ON TUESDAY 19th MAY IN WYNN’S HOTEL, ABBEY ST. DUBLIN 1 AT 2:15PM . UPDATE 20 MAY, 2015 ! The ESOP Trustee Board has announced the result of the recent ballot of ESOP participants. The ESOP Trustee Board declares that the motion to seek to amend the market rules to defer the Internal Market scheduled to take place on 29 May 2015 and to reschedule that market on a date no later than 30 September 2015 has been approved by 92% of votes cast. The ESOP Trustee will shortly be writing to all ESOP participants on this. St Patrick’s Credit Union are now inviting applications for a members Car Draw. The cost is €1 per week. There are a number of payment options, including an annual deduction of €52 from your shares. The first draw will be in the summer so enter by 31st May 2015 to be in with a chance of winning a brand new Nissan Qashqai. Below is a link to a video of a Question and Answer in the Dail recently from Clare Daly TD to Labour TD Jed Nash on 12th. February, 2015 on access to State Machinery for pensioners. Thinking_Ahead_Serious_Illness Book from MABs re Wills etc.